"How could you take part in this outrage?" The first such call came from a friend on Wednesday, close to midnight, just after I had stopped surfing Russian TV newscasts, all full of proud reports that TIME had named Russian President Vladimir Putin its Person of the Year. "Is this the Moscow correspondent of the U.S. magazine most loyal to Putin?" wondered the next caller. A friend in the U.S. e-mailed me: "Putin's Time's POY? Well...But we still love you." All these old friends  intellectuals and members of the social elite, for the most part  were teasing me. But not entirely. "Every joke contains a bit of the truth," one of them remarked in passing. As we discussed Russian TV's positive though shrill initial reactions to TIME's announcement, I realized that Putin was not all that far from the truth when he told the magazine's editors at the Person of the Year interview that Russian TV, however state-controlled, was free. Most commentators freely hailed Putin's achievment of putting Russia back on the world map and just as freely pruned TIME's analysis of what happened on his road to achieving it: the suppression of democratic freedoms. "How do you think this coverage will affect the ordinary people?" asked a friend that night. "Those who will never enter TIME.com or read TIME's print version?" He believed they would stay brainwashed into thinking that TIME magazine endorsed and promoted Putin and his politics. Then, I received a call from Echo Moskvi, the last liberal Moscow Radio station, which is something of an on-air Hyde Park for limited numbers of intellectuals, a small arena for them to spout off, not unlike the old Soviet-era Literaturnaya Gazeta. I explained as briefly as I could: it's not an endorsement or a distinction. Hitler and Stalin were Men of the Year, because they left indelible imprints on their respective years' events, which were to influence history. TIME journalists are like investigators who explore, gather and present facts on the assigned case as thoroughly and conscientiously as possible, allowing our audience to make decisions and pass independent verdicts on whether a given person has made such an impact for better or worse. In Putin's case, I told the radio interviewer, it was crucial to the Person of the Year decision that he had revived Russia, returning it once again to its integral role in international politics and the global economy. But Putin had accomplished this by suppressing the freedoms, however frail and imperfect, that Russians enjoyed in the 1980s and '90s. The majority of the Russian people supported Putin in his policy of swapping freedoms and democracy for stability and order  or, in the eyes of critics like myself, for the illusion of stability and order. 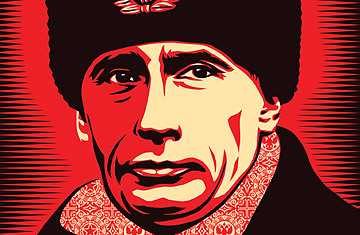 Ordinary Russians believe Putin's impact is for the better. I told Echo Moskvi that I thought his impact was for worse. Only time (and TIME) will tell. They thanked me and cut off. After hearing my views on the air, other friends called to express appreciation. One peculiarity of my almost 20 years experience as the only Russian citizen among the select corps of TIME correspondents is that I often enough fail to see Russian matters eye-to-eye with my friends and colleagues at the magazine. Not that I always prove right. Still, I believe I'm right about this: Putin's formal emergence as the only viable national leader, and his tacit acceptance of the role, mark for Russia a point of no return in its slide into a new authoritarianism, the shape and nature of which cannot yet be fully defined. I'm sure that the period of Putin's rule  which I predict will be long  will once again put the country in the situation described by the great Russian historian Vasili Klyuchevsky almost a century ago: "The state was swelling up, the people were withering." Nor do I agree with the view, espoused by some of my American colleagues, that this regime is dangerous for Russia only: the export of corruption, merged with the state machinery, is no better than the export of revolution. And that is why I believe that Putin was the correct choice as Person of the Year  because no other person this year made a deeper or more fateful impact on history, present and yet to come. As I walked outside my dacha gate this morning, my friend Volodya was fiddling with his car. I asked what he thought of the coverage the Russian electronic media had been giving Putin as the magazine's choice. "What's that all about?," he asked, while fixing something in the engine compartment. "I was busy all day yesterday  first work, then picking up my kid from his nursery school, then running my wife's errands." I told him that the Russian President had been picked by TIME as the Person who made the deepest impact on this year's events. "I dunno," said Volodya. "I'm just making my living. And who cares, anyway?"